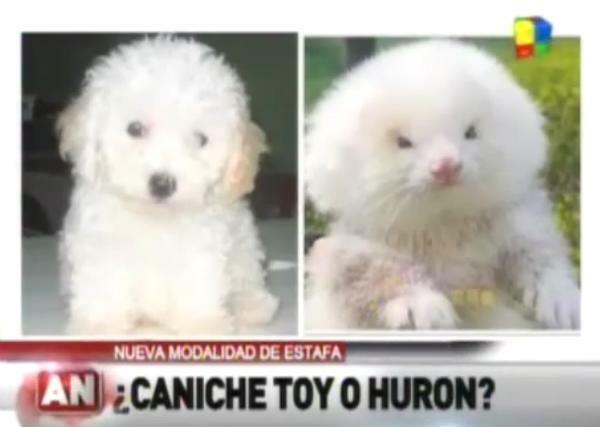 An Argentine man who thought he bought a pair of poodles at an outdoor market in Buenos Aires brought them home to the vet only to be told they were actually ferrets on steroids, reports the Daily Mail. The man, a retiree from Catamarca, purchased the animals at La Salada, Argentina's largest bazaar. The veterinarian informed him the ferrets "had been given steroids at birth to increase their size and then had some extra grooming to make their coats resemble a fluffy toy poodle," the paper says, translating a report from a local Argentine TV station. He paid $150 per poodle. Another woman interviewed by the station said she was tricked into thinking she had purchased a chihuahua at the same market. • Ferrets typically have brown, white or mixed fur and are around 51 cm in length—which includes a 13 cm tail. • They weigh around three pounds and have a lifespan of 7 to 10 years. • When happy, ferrets may perform a routine known as the weasel war dance—which is characterized by a series of hops and frenzied attempts to bump into things. • This is often accompanied by a soft clucking noise called dooking. When upset, ferrets make a hissing noise. • Toy poodles are known for their intelligence and are around 25 cm tall and weigh around nine pounds. • If a toy poodle exceeds 25 cm height, it cannot compete in any dog show as a toy poodle. • Toy poodles have been known to live as long as 20 years. • Toy poodles are described as sweet, cheerful, perky and lively, and they love to be around people.